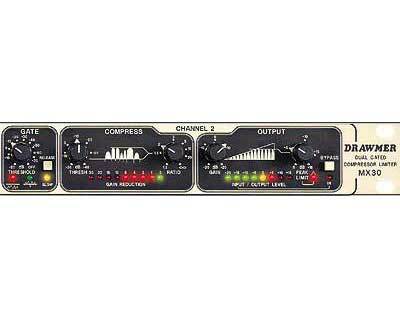 The Drawmer MX30 is a clean, natural sounding, variable ratio soft-knee compressor with useful features. The controls are kept to a simple minimum, reminding me a bit of the old dbx 160. The first section is a gate threshold control with switchable fast/slow release. The familiar Drawmer LEDs show the gate status. The second section has the compress threshold level and ratio controls and an LED meter showing gain reduction. The third section has a gain make-up level and peak limit level, able to give a bullet proof safety limit. The LED metering here shows input or output levels which can be usefully compared by pressing the bypass switch during setup. Rear features include balanced XLR (+4dB) and unbalanced jack (-10dB) ins and outs. The MX30 can run in either dual mono or stereo linked mode. Summary: Easy to use and learn, even for those with little experience of compressors. The front panel artwork makes it really easy to understand and the extensive LED displays show you exactly what the unit is doing. The build quality is good and robust and it has a proper power supply built in (so no more wall warts). The choice of interfaces makes it quite suitable for home and professional applications. Excellent value for money.